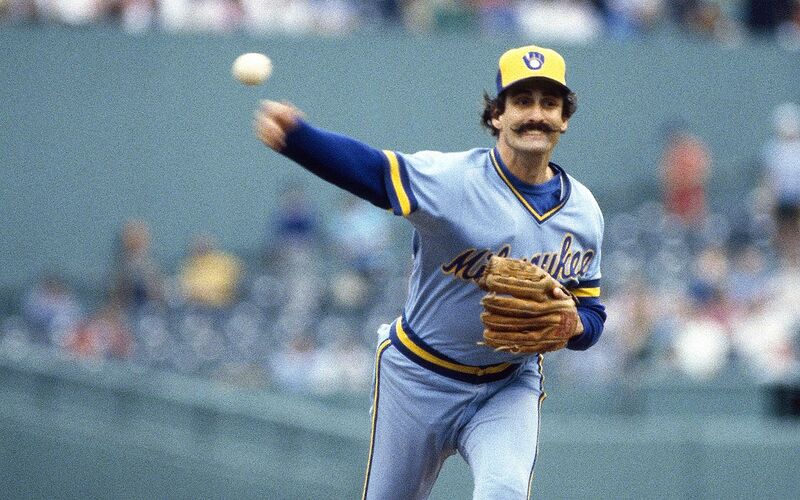 Milwaukee Brewers reliever Rollie Fingers spent the first two months of the 1981 offseason adding hardware to his trophy case. First, he won the Cy Young Award as the American League’s top pitcher, and then he took home honors as the league’s Most Valuable Player. Fingers became the first reliever – and the first pitcher since his Oakland teammate Vida Blue in 1971 – to win both awards. Fingers was humble after receiving the MVP award and noted many players who had great seasons and could have won the award. Oakland outfielder Rickey Henderson hit .319 and had 56 stolen bases in the strike-shortened season and finished a mere four votes behind Fingers in the voting. Baltimore first baseman Eddie Murray, Boston outfielder Dwight Evans, and Oakland outfielder Tony Armas were next on the list. The three tied for the AL lead in home runs with 22, but Murray drove in the most runs (78) and had a higher batting average (.304) than the others. The Professional Baseball Writers of America cast 15 first-place votes for Fingers, nine for second, two for third, one for fourth, and one for sixth, which totaled 312 points. Henderson had 12 first-place votes but may have won the award had his teammate Armas not gotten a lone first-place vote. The pitching numbers for Fingers were stellar despite the mid-season two month break due to the player’s strike. He was a key leader behind the Brewers winning the second-half title in the AL East. In 47 appearances, he posted a slim 1.04 ERA with a 6-3 record and 28 saves. The ERA was his lowest single season mark as well as being lower than career marks by Bruce Sutter, Mariano Rivera, and Trevor Hoffman. He walked just 13 batters and gave up 55 hits in 78 innings for a WHIP of 0.872. Fingers called it his best season ever and said he was surprised at winning the MVP award, but happy. Three of those runs came on a homer by Evans in late May to tie the game 6-6. Boston scored another run off Fingers in the 10th inning and gave him one of his three losses. Fingers had spent the first nine years of his career in the AL, before playing with San Diego for the next four years. He had been working hard to re-acclimate to AL hitters and didn’t realize Evans liked to swing at 3-0 pitches. Fingers threw a fastball over the middle of the plate and Evans jumped all over the pitch. Second baseman Jim Gantner said that was the only pitch he saw Fingers throw down the middle of the plate that season. In his opinion, the pitch was the only mistake Fingers made the entire season, and joked that it was his own fault for not telling Fingers. Fingers had a long history with success and winning awards going back to his days with Oakland when the team won the World Series 1972-74. He was the series MVP in 1974 and then went on to win the National League Fireman of the Year with San Diego in 1977-78 and 1980. 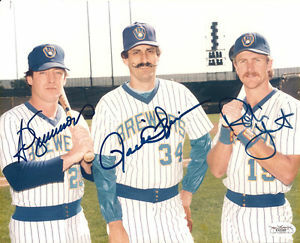 The stint with the Padres ended with a trade to St. Louis, who traded the hurler to Milwaukee four days later with Ted Simmons and Pete Vuckovich. Fingers maintained that awards at the end of the season were fine, but he was really shooting toward getting back to the World Series with the Brewers. 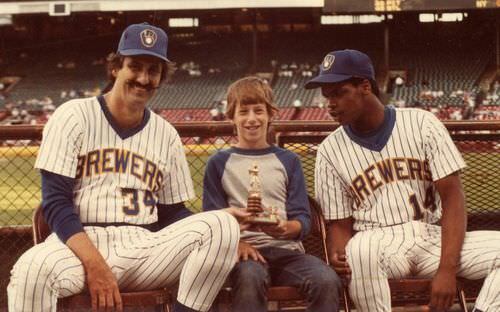 His teammates knew that if they had Rollie Fingers, they had a shot at getting to the World Series. While Fingers like to remain loose off the field and joked around, on the mound he was all business. Third baseman Paul Molitor could attest to his behavior on the field. Thanks for reading! My next book after the Brewers historical book is a personal story that I think many can relate to – it’s about fathers and sons, fishing, baseball, health struggles, and grieving. Please consider voting for The Long Lake Journal in a writing contest. Thanks so much!